A quarter century ago Vietnam Veterans of America began sending Veterans Initiative delegations to Vietnam in a pioneering effort to break the impasse in resolving the fate of Americans and Vietnamese missing in action. 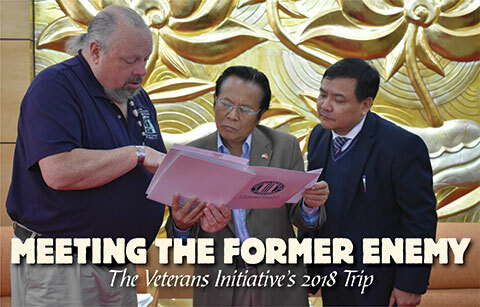 Ignoring the naysayers in the federal government and in other veterans organizations, the VI worked hard to build trust so that the two former enemies could work together to bring home the remains of their dead. Between January 19 and February 10, a three-person VI delegation met again with its counterparts in Vietnam. VVA Vice President Marsha Four, POW/MIA Affairs Committee Chair Grant Coates, and Communications Director Mokie Porter had arranged to meet with groups they had talked to in 2017. A medical emergency required Vice President Four to be hospitalized in Hanoi and medevaced home to Philadelphia. Coates and Porter met first with Defense Prisoner of War/Missing in Action Accounting Agency, Detachment 2, Hanoi. Detachment Commander Lt. Col. Romel Pajimula led a briefing on current and projected field activities, including underwater investigations in the South China Sea. He said that excellent cooperative relations aided in the recovery efforts of four cases. Although the passage of time makes investigations more difficult, Pajimula said, restriction bans on excavations in Than Hua and Haiphong Provinces have been lifted. During a meeting with the Vietnam Union of Friendship Organizations, VI team members and President John Rowan were awarded the Medal for Peace & Friendship Among Nations “to recognize and honor the contributions of organizations and members of VVA in consolidating and strengthening friendly relations and cooperation between two peoples.” Don Tuan Phong, Vice President and Secretary General of the Union, thanked VVA for its contributions. Amb. Nguyen Tam Chien, Chair of the Vietnam-USA Society; Bui The Giang, Deputy Chair; and Bui Van Nghi, Secretary-General, attended the ceremony, as did representatives from Vietnam’s Central Commission for External Relations, Ministry of Foreign Affairs, and Vietnamese-American Committees. The Veterans Association of Vietnam’s Director of External Relations, retired Col. Tran Ngoc Dan, chaired the next meeting. “Your program is very useful to both sides. We have done well in the past,” he said. “We need to continue delegations on both sides. We continue to look for information like your pilots, and we continue to look forward to receiving information on our missing from war. One of our main tasks as an organization and as individuals is to continue to cooperate with veterans of our country’s past wars to return the remains of their loved ones and our war martyrs.” VAVN has four million members. A meeting with the Ministry of Foreign Affairs was given a fresh twist by the announcement that longtime VI supporter Ha Kim Ngoc had been appointed Vietnamese Ambassador to the United States. Also in attendance was a representative from the Vietnam Office Seeking Lost and Missing People. During a January 24 meeting with the Ministry of National Defense, Col. Nguyen Quang Vinh led a Vietnamese panel of officers representing the Department of Welfare and the Department of Foreign Affairs and War Legacy Issues. They discussed relations between the U.S. and Vietnam, including senior dignitary visits with the U.S. President and Secretary of Defense, the porting of a U.S. carrier strike group in Da Nang, maritime security, war legacy issues and cooperation, and the push for increased documentation in MIA cases. As in 2017, the VI team had a meeting with the Vietnam Association for Victims of Agent Orange/Dioxin (VAVA), which was conducted by Lt. Gen. Nguyen Van Rinh, Chair, and Pham Truong, Director of External Relations. 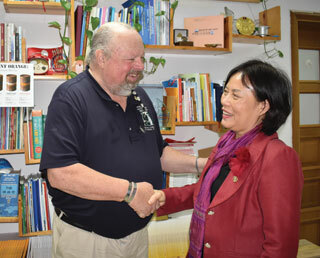 Meetings also were held with VAVA, V-US Friendship Association of Thau Thien-Hue Province. Coates and Porter learned that last June 127 bodies had been recovered from the edge of the runway at Tan Son Nhut airport. The Ministry of Defense determined that 145 sets of remains have been identified. 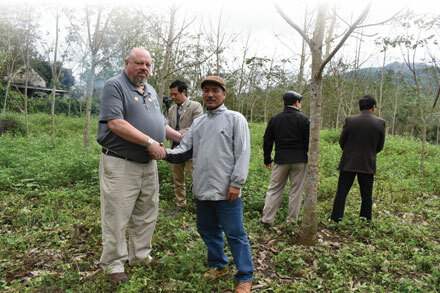 “We now are seeing four generations of victims of Agent Orange. The support is a long-term consequence,” said Nguyen Dung, Vice Chair of the Peoples Committee of Thau Thien-Hue Province. Accompanied by a Vietnamese veteran, the team revisited Camp Carroll, where seventy-six NVA and VC bodies had been recovered with help from information about a mass grave received through the VI. 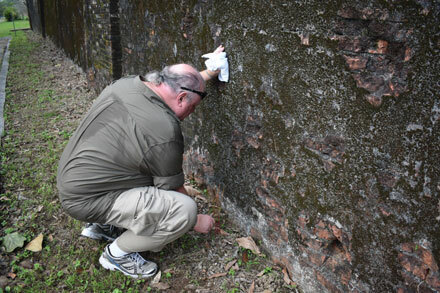 The team also revisited the site of Firebase Tomahawk, where nine Americans and twenty-three North Vietnamese were killed. 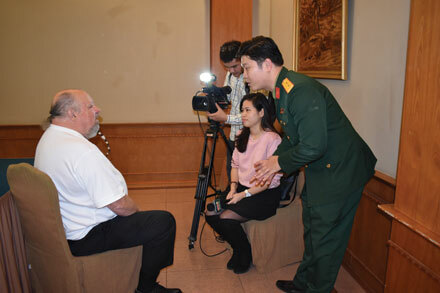 In Da Nang Coates and Porter met with the Da Nang Union of Friendship Organization and also with Victims of Agent Orange/Dioxin of Da Nang City, VAVN, and the Peoples Committee. In Tam Ky, Quang Nam Province, once Quang Tin, more meetings were held. Meetings with VAVN were productive and enlightening, Coates said. Vice President Four said the Veterans Initiative over the past twenty-five years has pushed forward the relationship between the two countries. 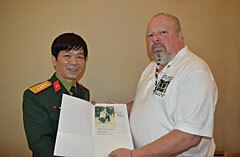 VAVN officials also appreciated VI team members revisiting Vietnamese war cemeteries.